Devils Backbone Brewing Company has a very special Adventure Pack release available July through September: the Family Member Beer Project. During this 15-month project, employees from every branch of the Devils Backbone family tree, from servers to members of the sales team to packaging hall employees, formed into 12 groups, each led by a brewer. The groups selected the style, ingredients, and name of their beer and then brewed it together. Our brewers chose five of these beers to include in the final lineup of this Adventure Pack. The mixed 12 pack includes Ale of Two Cities, an Amero Kolsch-style ale; Apple-achian Pie Stout, an ale brewed with apple, spice, and molasses; Hot Shot IPA, an India pale ale brewed with jalapeno peppers; Space Fruit Pale Ale, an ale brewed with new world hops; and Tropical Thunder, a crystal-weizen ale brewed with pineapple juice. Included in the pack with these five beers is Vienna Lager, the beer that is family to Devils Backbone. “As our company grows, it’s easy to get caught up in each of our individual roles and become distracted from the core thing that we do and that people love us for: the beer. I proposed the Family Beer Project because it’s hugely important that we all always maintain a strong, personal connection to the art and science of making a beer, no matter what other professional responsibilities fill our days,” says Chief Operating Officer Hayes Humphreys. A blend of traditional German brewing tradition and American hops. Ale of Two Cities has great malt character up-front with a crisp clean finish. Low ABV and very drinkable. The members on this team have close ties to Appalachian Virginia. The stories of Virginia moonshiners using local apples to make their shine was the inspiration behind this brew. Ingredients include apple butter, pie spice, and blackstrap molasses. A tribute to some of the Devils Backbone Mug Club members who travel out west every summer to bravely fight wildfire. The addition of jalapenos provides a nice “hot shot” to this well-balanced IPA. Jalapeno, hop, zip. Designed to introduce both hop-heads and those who don’t know they’re hop fans yet to a mildly bitter, yet still hop forward beer using Galaxy (Space) and Citra (Fruit) hops. A nose of pineapple and tropical fruits with a slight hop linger. Tastes clean and crisp with small amounts of banana Weissbier aroma coming through and finishing with a tropical fruit and pineapple hop kick. Vienna Lager is amber in color with a subtle toasted caramel note and a smooth malty finish. Brewed using a combination of Northern Brewer and Saaz hops with Vienna, Pilsen, Dark Munich and Caramel malts and allowing five weeks for the lagering process and the flavors to fully develop. When first timers at Basecamp Brewpub & Meadows are overwhelmed by the array of beers, our helpful staff usually suggests a sampler flight. The Adventure Pack recreates that sampler experience. This pack is on retail shelves now throughout Virginia, District of Columbia, Maryland, North Carolina, and West Virg­inia. It is also available on draft in limited quantities. Devils Backbone operates two breweries in central Virginia: Basecamp Brewpub & Meadows (200 Mosbys Run, Roseland, VA) the original brewery, restaurant and the Meadows, the new outdoor beer and dining area, located at the foot of the Three Ridge Mountains in scenic Nelson County; and the Outpost Brewery & Tap Room, a state-of-the-art production brewery and tap room (50 North Wind Lane, Lexington, VA). 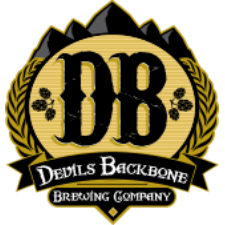 For more information on Devils Backbone, please visit the website, www.dbbrewingcompany.com. You can also follow along as they Craft an Adventure on Facebook/devilsbackbonebrewingcompany, Twitter @dbbrewingco and Instagram @devilsbackbonebrewingcompany. For Adventure Pack Collaboration Sampler beer details, brew day highlights and release information, please follow along on social #DBadventurepack.